Nona shown here with her husband Renante, 33, is married and the mother of four children aged five to 17. She is from Carles, Iloilo, in the Philippines. Nona has been engaged in the fishing business for many years. Her husband works as a fisherman too. 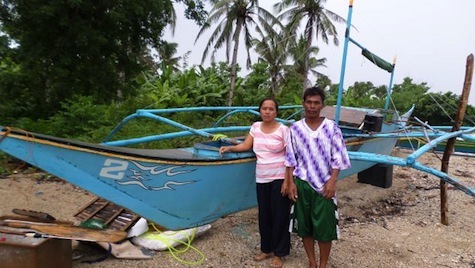 Together, they work hard to provide for their family through fishing. Nona is asking for a loan to buy a new engine and compressor. These parts will replace the old ones, which always malfunction and cause delays in their fishing activity. Nona dreams of expanding her family's livelihood and saving money for her children's tuition. Congratulations to Nona in the Philippines)..!